There are so many irresponsible dog's owners walking Las Vegas streets with off-leash dogs. I'm tired of hear "my dog had never been aggressive toward anyone". But victims of dogs bites can tell you painful stories of such bites. There are hundred of dog parks around Vegas. Why in this world they have to walk on the Strip, around narrow walking such as washes, places full of babies, kids? I did give up walking with a group of people at the Pittman Wash. It is a very narrow path; even thus dogs' owners walk their dogs taking completely the whole path. They don't care. Plus, down the wash is their dog's bathroom. The smell is horrendous. LAS VEGAS -- Two kids are recovering after being mauled by two dogs. Police said the dogs were taken to the Animal Foundation Shelter to be placed under standard quarantine. Neighbors say their heard screams on Wednesday around 5 p.m. on Abrams Avenue. Resident Pam Stewart was inside her home and came out to investigate. She said, two pit bull mastiffs were loose and terrorizing the neighborhood. "They were screaming for help," Stewart said. "I saw the little girl lying on the ground with her face halfway off, and it just made me sick." A friend of the 12-year-old victim said neighbors were able to beat one of the dogs away with a golf club. "They scratched her and almost scratched her eye out. It was pretty bad," 10-year-old Bryan Esquival said. Paramedics showed up and took the girl to the hospital, but the attack wasn't over. Las Vegas, NV (KTNV) -- A woman has been hospitalized after surviving a pit bull attack in the southeast part of the valley. It happened around 5 p.m. Monday night near Tropicana Avenue and McLeod Drive. The Las Vegas Metropolitan Police Department said Tracy Mischel was walking her two small dogs when two pit bulls attacked her. One of the small dogs did not survive the attack, the condition of the other is unknown at this time. A pair of bullmastiff dogs were impounded at a Las Vegas animal shelter after the two attacked a boy and girl in a northeast Valley neighborhood. Las Vegas Metro police said the attacks happened at about 5:15 p.m. Wednesday in the 4000 block of Abrams Avenue, near Sandhill Road and Washington Avenue. According to Las Vegas Animal Control, the canines got loose from a home and attacked a 12-year-old girl and a 5-year-old boy. Both were bitten by the dogs. Animal control said the boy was taken to University Medical Center Trauma, while the girl was taken to Sunrise Hospital. Metro said at least one of the children was being treated in serious condition. The two canines were being held at Lied Animal Shelter during the investigation. Neighbors are still shaken up over the attack. "Me and my family were inside. All of a sudden, we hear this screaming and racket, commotion outside," said neighbor Kimberly Grajeda. Grajeda witnessed part of the attack. She said her nephews would often play with the boy who was attacked. A children’s game of Four Square was brought to an abrupt end when Tiny and Tank barrelled in, agitated. Tank, a large 6-year-old brown brindle bullmastiff who weighs about 120 pounds, and Tiny, a large 4-year-old black and white pitbull who weighs about 50 pounds, escaped from their home across from Desert Pines High School on Oct. 23 and bit two young children severely enough to require hospitalization, according an animal control report. 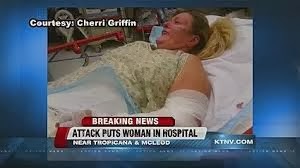 LAS VEGAS -- A woman is recovering after being attacked by dogs in a neighborhood near Cheyenne Avenue and Jones Boulevard Friday morning. According to a spokesperson with the City of Las Vegas, the woman was approaching a home at around 10 a.m. when the dogs attacked. The dogs bit her head and her leg. The bites were severe enough that she was taken to the hospital. Homeowner Dahl Baca didn't want to show her face, but lives near by where the attack happened and said the owner has a history of not taking care of the dogs. The last day of little Jeremiah Eskew-Shahan's life started out as one of his best. He spent it celebrating his first birthday with his father, grandmother and other family members in their spacious Henderson home. He unwrapped presents with the beloved family dog, a mastiff-Rhodesian mix named Onion who had recently turned 6 years old. Jeremiah got a roomful of toys, including a battery-powered car and a floating frog for the bath. Onion got squeaky toys. They played together all day Friday. After the long, joyful day, Jeremiah was exhausted. "We were just about to put him to bed," around 10 p.m., when it happened, said his father, 29-year-old Christopher Shahan. He shares custody of Jeremiah with the boy's mother. The two aren't married. Jeremiah's grandmother gave him a bottle and laid him down in the living room. The baby crawled over to Onion and - as he had done many times before - grabbed onto the 120-pound dog to help himself stand up. Just then, Jeremiah's grandmother leaned over to pick him up. Onion suddenly attacked. He latched his jaws around the boy's head and began shaking him back and forth. Jeremiah's grandmother wasn't strong enough to pull the boy away. Shahan heard the commotion from upstairs and raced to rescue his son. "I got the dog off the baby," he said. "I tried to save my baby." The entire episode lasted about 30 seconds. It was long enough to break Jeremiah's neck and cause other unspeakable injuries, Shahan said. Paramedics rushed to the home on Navarre Lane, near Arroyo Grande Boulevard. They took Jeremiah to St. Rose Dominican Hospital, Siena campus. He was then flown to the trauma unit at University Medical Center, where he died early Saturday morning. "I feel like I'm in a zombie state," Shahan said Saturday evening while standing in front of his home in the otherwise quiet neighborhood. Jeremiah "was the best thing I've ever had in my life. He was the best baby. He always smiled, always." Onion had been with the family since he was a puppy. He helped Jeremiah's grandmother keep her spirits up when she was suffering from lung cancer, Shahan said. The committee examining problems on the state’s most famous thoroughfare will expedite its evaluation of a ban on pets on the Strip, after a California man was bit by a dog on a Strip pedestrian overpass last week. Since the Jan. 11 incident, Clark County Animal Control has been unable to locate the dog or its owner, a woman who was on the overpass begging for money. ... As a result, she is afraid to walk in her own neighborhood, home to a lot of kids. Animal Control paperwork said that the pit bull, which was quarantined, was to be released from Lied Animal Shelter on Monday, only 10 days after the incident. When asked for comment, the dog’s owner refused to give a response. The case is still under investigation. Like I said, they don't care. The Fila Brasileiro (Portuguese pronunciation: [ˈfilɐ ˌbraziˈlejɾu]) also known as the Brazilian Mastiff is a large working breed of dog developed in Brazil. It is known for its superb tracking ability, aggressiveness and an unforgiving impetuous temperament. When a Brazilian Mastiff finds its quarry, it does not attack it, but rather holds it at bay until the hunter arrives. Owing to these qualities, the Brazilian Mastiff is used as a guard dog, as a shepherd dog for herding livestock and as a hunting dog for tracking and controlling large prey. When slavery was legal in Brazil, the Brazilian Mastiff was used to return fugitives unharmed to their slave masters. 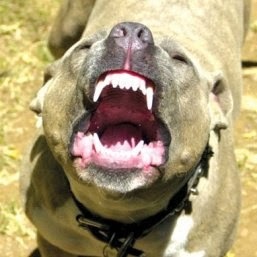 Owing to its size, temperament and potential for aggression, the Brazilian Mastiff has been banned in many countries. Four Great Dane dogs mauled an 11-year-old boy who was feeding them Wednesday afternoon, leaving the child hospitalized with life-threatening injuries caused by dozens of bites. The father of sixth-grader Michael Foley staged a heroic rescue after hearing his son's cries for help, leaping a fence and pulling his son away from the dogs, friends and relatives said. Paramedics responding to the 3:50 p.m. incident in northwest Las Vegas flew Foley by helicopter to University Medical Center, where he was rushed to the operating room for several hours of surgery. "When the doctors were looking at him, they couldn't even tell how many bites were on him," hospital spokesman Rick Plummer said. "He had bites on him from head to toe. ... It's like someone took a spoon and dug his flesh out up and down his body." Foley was in critical condition in the pediatric Intensive Care Unit following the surgery, which Plummer said doctors deemed a success. "He seems to be doing well," Plummer said. "A lot of the bites were deep. He's a pretty lucky kid." Authorities said the boy was tending to the Great Danes, very large dogs noted for their muscularity, for a neighbor who was out of town. Two residents in Foley's neighborhood near U.S. Highway 95 and Durango Drive said in separate interviews Wednesday evening that their pets have been attacked by the same neighbor's Great Danes. Deneb Ranciato, who lives across the street from the Foleys, said two of the dogs escaped their pen in May and mauled her dachshund to death. "He was tied to a rope in the back yard and they came at him from both sides," she said of her slain pet. "Since that day, my mother won't even go for a walk around here. She's scared of them." Another neighbor, Karen Hennessey, said two of the Great Danes jumped a fence in November and attacked her Rottweiler while her father was walking it. "After the first attack, we were a little concerned about our children," Hennessey said. But Hennessey said she was appeased and her fears were slightly eased after the dogs' owner paid the veterinary bills for the Rottweiler's injuries, had one of the Great Danes put to sleep and moved all the dogs to a more secure pen in the back yard. Foley's family and neighbors identified the dogs' owner as a woman named Dail, and said she was in Chicago. Clark County assessor's office records identify the owner of the home where the dogs were captured as Dail Koehler. Attempts to reach Koehler were not successful late Wednesday. Sgt. John Fudenberg with the Las Vegas Department of Detention and Enforcement said police called animal control officers to the dog owner's home, 8631 Rocky Ave., about 3:55 p.m. to round up the animals. Las Vegas police officers roamed the property clutching shotguns while animal control officers approached the dogs to impound them. Rowena Williams, who has been Foley's nanny since he was 2 months old, said Foley always feeds the animals when the neighbor is away. "He's known the dogs since they were puppies," she said. Foley's grandmother Dora Clemente said during a brief interview at the hospital that Foley's father, Chuck Foley, jumped his neighbor's fence to rescue his son from the dogs after hearing his son yell, "Help me! Help me!" The father jumped into the pen with the dogs and scared them off, Clemente said. "He's got a very deep voice, and he scared them away with his voice," she said. "He saved his life, in my opinion." She said her grandson is a strong, handsome boy who loves playing baseball, and enjoys caring for his neighbor's pets. "The dogs loved him, they played with him all the time," she said. Fudenberg said after checking city records that it appears animal control officers have never been called to the area for a complaint about the dogs involved in Wednesday's attack. He said the Great Danes were taken to the Lied Animal Shelter, the city's privately operated pound, where they will be held during an investigation of the incident. Review-Journal staff writer Ryan Oliver contributed to this report. Animal control or health departments in at least 26 U.S. states report that pit bulls are biting more than all other dog breeds. These states include: Arizona, Arkansas, California, Colorado, Delaware, Florida, Georgia, Illinois, Indiana, Kansas, Massachusetts, Maryland, Michigan, Nebraska, Nevada, New York, North Carolina, Ohio, Rhode Island, Pennsylvania, Tennessee, Texas, Utah, Virginia, Washington and Wisconsin. The oft-quoted myth by pro-pit bull groups that pit bulls "do not bite more than other breeds" is positively false. 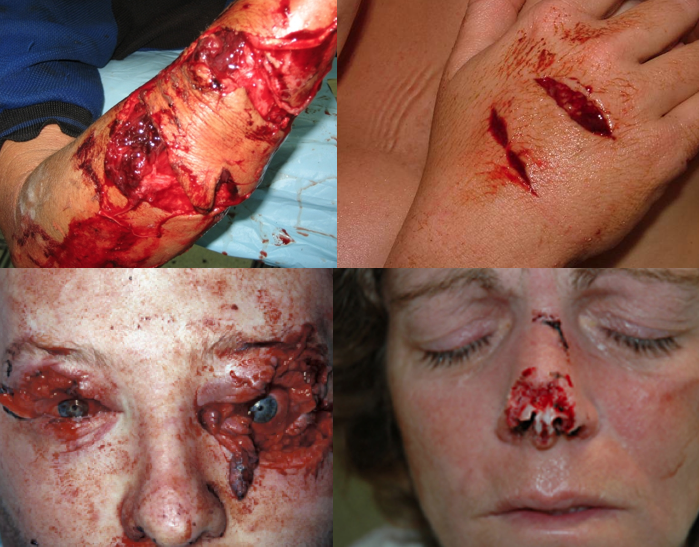 In addition to leading bite counts, the pit bull bite is also the most damaging, inflicting permanent and disfiguring injuries. Foreclosure dogs are also a big problem here in Vegas.